Airborne Launch Control Centers (ALCC—pronounced "Al-see") provide a survivable launch capability for the United States Air Force's LGM-30 Minuteman Intercontinental Ballistic Missile (ICBM) force by utilizing the Airborne Launch Control System (ALCS) onboard which is operated by an airborne missileer crew. Historically, from 1967–1998, the ALCC mission was performed by United States Air Force Boeing EC-135 command post aircraft. This included EC-135A, EC-135C, EC-135G, and EC-135L aircraft. Today, the ALCC mission is performed by airborne missileers from Air Force Global Strike Command's (AFGSC) 625th Strategic Operations Squadron (STOS) and United States Strategic Command (USSTRATCOM). Starting on October 1, 1998, the ALCS has been located on board the United States Navy's E-6B Mercury. The ALCS crew is integrated into the battle staff of the USSTRATCOM "Looking Glass" Airborne Command Post (ABNCP) and is on alert around-the-clock. From 1967 to 1992, three dedicated Airborne Launch Control Centers (ALCC) were on ground or airborne alert around-the-clock providing ALCS coverage for five of the six Minuteman ICBM Wings. These dedicated ALCCs were mostly EC-135A aircraft but could also have been EC-135C or EC-135G aircraft depending on availability. ALCC No. 1 was on ground alert at Ellsworth AFB, SD and during a wartime scenario would have taken off and orbited between the Minuteman Wings at Ellsworth AFB, SD and F.E. Warren AFB, WY providing ALCS assistance if needed. ALCCs No. 2 and No. 3 were routinely on forward deployed ground alert at Minot AFB, ND. During a wartime scenario, ALCC No. 3 would have orbited between the Minuteman ICBM Wings at Minot AFB and Grand Forks AFB, both in North Dakota, providing ALCS assistance if needed. ALCC No. 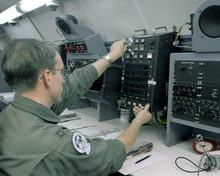 2 was dedicated to orbiting near the Minuteman ICBM Wing at Malmstrom AFB, MT providing ALCS assistance if needed. After 1992, with the end of the Cold War and the disbanding of the Strategic Air Command (SAC), ALCS remained on alert with the SAC and the US Strategic Command (USSTRATCOM) EC-135C Airborne Command Posts. On October 1, 1998 the Air Force’s EC-135Cs ceased to perform USSTRATCOM Looking Glass operations and was subsequently retired. The Navy’s E-6B Mercury took over USSTRATCOM’s Looking Glass mission and associated ALCC mission. Today, at least one E-6B Looking Glass Airborne Command Post (ABNCP) is on alert around-the-clock performing the ALCC mission. It is postured with a full USSTRATCOM battlestaff and ALCS crew on board to perform the Looking Glass mission in the event the USSTRATCOM Global Operations Center (GOC) is incapacitated. The aircraft can takeoff quickly to avoid any threat. The ALCS crew onboard still provides a survivable launch capability for the Air Force’s Minuteman III ICBMs located at the three remaining Missile Wings located at Malmstrom AFB, MT; Minot AFB, ND; and F.E. Warren AFB, WY. Just like its original inception, ALCS on alert today provides an adversary with an insurmountable task of trying to destroy the Minuteman ICBM force. Even if the ground Launch Control Centers are destroyed, airborne missileers utilizing the ALCS can fly overhead and launch the Minuteman ICBM force. The E-6B Mercury is the current ALCC aircraft.